I’m a believer in simplicity. My style is generally low key and classic. It keeps life from getting too complicated and doesn’t draw unnecessary attention to the giant lady in the room. I’m also mostly pro simplicity in the kitchen. I’m busy, and I don’t like things to get too crazy. But every now and then, even I need a little sparkle in my life. It feels good to slip on a cocktail dress or a sharp suit, and it can be awesomely delicious to trash up your favorite classic foods with some indulgent ingredients. 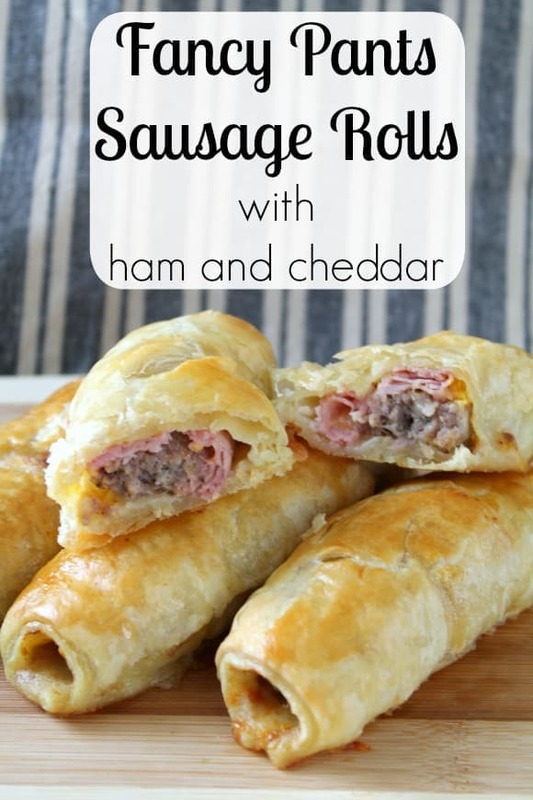 I took traditional sausage rolls and added ham, cheddar, and a bit of mustard. It’s salty, a little spicy, cheesy, greasy (in an awesome way) and completely delicious. Regular sausage rolls are great but these have that extra little bit of sparkle that makes them special. It can’t hurt to get crazy every once in a while. 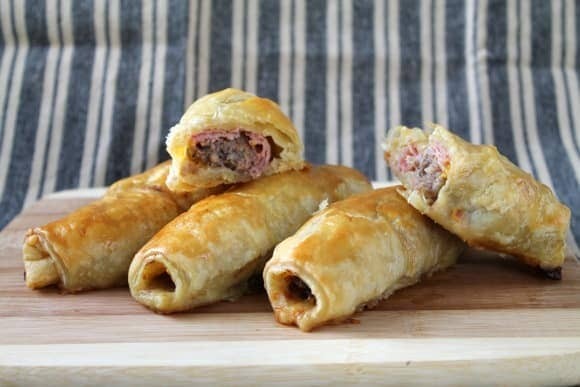 These Fancy Pants Sausage Rolls are perfect for a party because they can be served warm or cold, and they’re awesome either way. They also travel well, so there’s really no excuse not to make them for every conceivable situation. My English gentleman gives them an enthusiastic thumbs up. In fact,he literally ran to the kitchen when I reminded him they were there. If he gets excited, you know they have to be good. And if you want to make them extra fancy by spending a bit more money, you could sub the ham for proscuitto and use an aged English cheddar. I like it fancy, but I’m still cheap, so deli ham and cheap cheese work just as well. Put something fancy in your life every now and then. The added effort is minimal, and the effect is awesome. 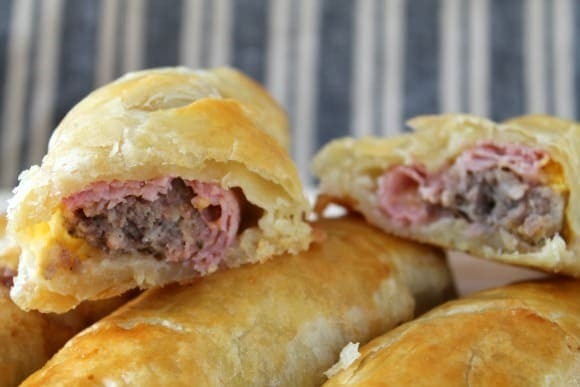 Traditional sausage rolls are made fancy with a slice of ham, a pinch of sharp cheddar, and a shot of mustard. Preheat your oven to 400 and line a baking sheet with parchment paper. Get all of your filling ingredients ready so you can assemble your rolls quickly before the dough gets warm. I remove all the sausage from the roll and put it on a small plate. Then use a steak knife to cut the sausage down the middle lengthwise, then into six sections across to divide it into twelve pieces. On a lightly floured surface, unfold one sheet of your puff pastry. Use a pizza cutter to cut your puff pastry into six rectangles. Add a slice of ham, an pinch of cheese, and a thin line of mustard to each section. Add a 12th of the sausage to each section and spread it lengthwise. You can go all the way to the end of the roll, but be sure to leave empty space along the sides to seal. Here's how I roll them. Pull the right side of the dough up and into the middle of the sausage. Dab a bit of water down the side of the dough you just folded over. Pick up the whole section and hold it in your non-dominant hand. Stretch and pull the other side of the dough to overlap slightly and seal the roll. Use a fork to close up the seam, then place the roll, seam side down, on your baking sheet. Brush your beaten egg on the top of each roll, then use a sharp knife to cut two vents into each roll. Put the first set of rolls in the oven for 25 minutes, and repeat the process with the second sheet of puff pastry. Allow the rolls to cool on the pan for a few minutes, then remove them to a wire rack. These can be served warm, room temp, or cold.